The phrase “good things come in small packages” doesn't go wrong when we think of ants. These tiny creatures strive to survive floods by transforming the food into rafts. They find their way home using an internalized GPS system they have and can even liftup to 20 times their body weight. It is proved by scientists that the insects, whose brains are smaller than a quarter of a small pin’s head, will possiblyeven use tools, a skill that was once thought to be the sphere of “clever” species like humans and a set of other animals. The researchers from the University of Szeged in Hungary have exposed that when given a choice, these clever insects even have the brilliance to select the most efficient tool for doing their job. The team, led by Istvan Maák, have conducted experiments on two species of funnel ants— A. subterranean and B.senilis. This is to test their tools selectivity, both the insects were presented with various liquids containing both pure and diluted honey, along with a variety of instruments to help the ants to transport the honey to their nests. The insects would find these tools in the wild, such as brushwood, pine needles and soil grains. The team also added some artificial ones, like sponge and paper. You can see them in the below image. 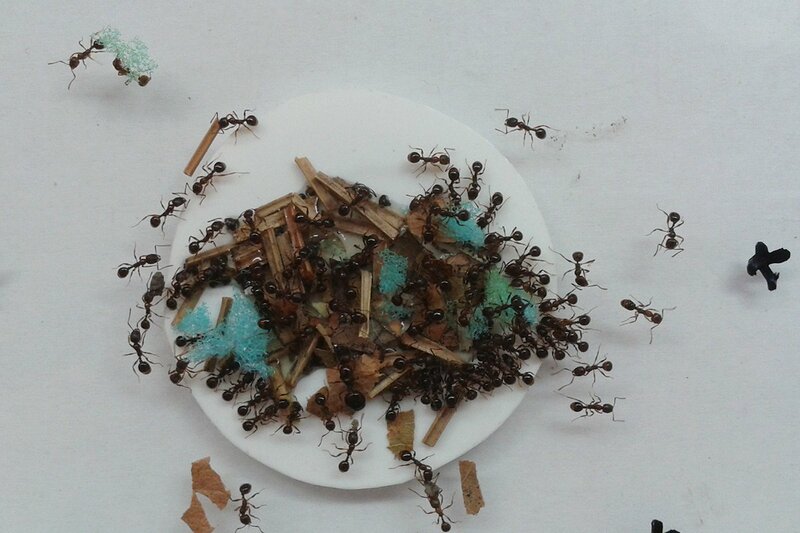 This activity was a serious observation for the team, who tried to grab the ants behavior in transforming the food to their homes. While the members of the subterranean quickly settled on using tiny soil grains for the diluted honey and sponge to soak the pure honey. They even learned on how to rip the sponge into smaller, more manageable pieces. The members of senilis, carefully tested each option before they switched solely to paper and sponge, this indicates that they were learning and analyzing the properties of the different tools at their dumping. However, the researchers who published these findings in a journal of Animal Behavior, in January, believe that the weight may have played a major factor in their choice. The ants eventually chose their tools based on how easily they can carry out and how well they engrossed the honey. The ants also treated the diluted honey and pure honey differently.By screening the two choices, they were aware of how both the liquids interacted with the various tools. The above table helps you understand the soaking properties of the different tools used by Subterranean. The above table helps you understand the soaking properties of the different tools used by senilis. While the ants, in the past, have the largest brains of any insect, have been observed using mud or sand grains as tools to transport the liquid. Though inspiring, these are commonly found in their natural surroundings. What surprised the scientists is the ability of them to select from foreign objects like paper and sponge, which is a complex cognitive task. The team believes that the funnel ants evolved this cognitive meting out because unlike other members of their species, they can’t even expand their stomachs to hold more food. Hence the reason why theyfound an alternate way to transport food, which again, is a critical task for them to survive.